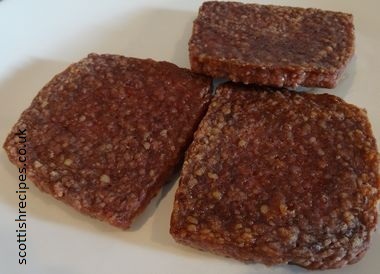 It is also known as the Lorne sausage after stage comedian Tommy Lorne who loved this meat product and wanted an easier way to put them into a sandwich to eat between acts. Today a square sausage butty or roll is still as popular as ever in Scotland, and often includes a fried egg. It is also eaten with a cooked breakfast. Lorne sausages are not named from the Scot's village namesake, but originate from Tommy's hometown of Kirkintilloch near Glasgow. The Scottish Lorne sausage is quite high in calories, though some butchers are now making some low fat ones for their customers. The high fat content, usually 20%, is needed to prevent them drying out during cooking. It is usually made from equal measures of minced beef and pork (450g), an egg to bind the ingredients with rusk such as breadcrumbs (170g) and salt and pepper seasoning. Spices used in a traditional square sausage recipe will be nutmeg and coriander seed to give the much loved spicy flavour. Just a teaspoon of each. These are then mixed together in a large bowl and if the mixture gets too dry water can be added. 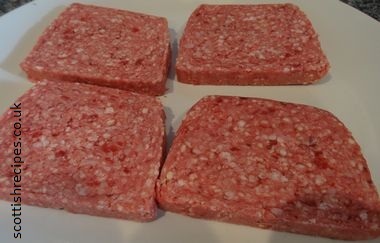 The Lorne sausage recipe can then be formed into a huge rectangular shape block and cut individually as needed to a thickness of 10mm. This is then gently fried, much like bacon, turning once, until brown. The raw block or slices can be frozen and defrosted when needed. Have you tried Square Sausage Ice Cream?